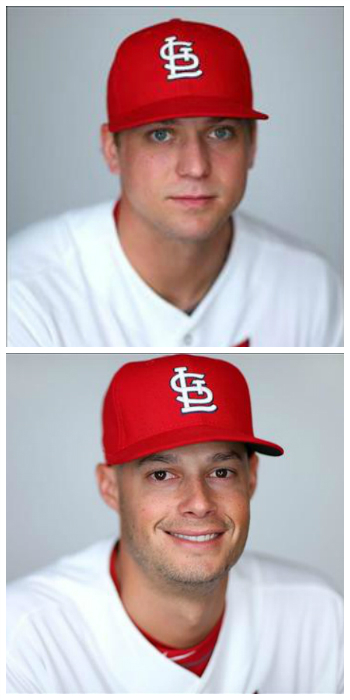 Yes, Trevor Rosenthal already was anointed the closer for 2014. Cardinals manager Mike Matheny and general manager John Mozeliak both made that very clear back in November, and Trevor was obviously very good as closer from late September throughout the postseason. He’s very good, period. In his 98 big league innings, he’s struck out 133 while walking just 27 and giving up 29 earned runs. That 100 mph fastball makes Cardinals fans and national broadcasters gush, especially because it’s led to so many of those strikeouts. We know too that he wants to be a starter instead of a reliever. He said it last fall, he said it again on Saturday at the Winter Warm-Up — jokingly, according to Derrick Goold’s tweet. He was a starter in the minor leagues, exclusively so from midway through the 2010 season until he was called up to the Cardinals during 2012, and he was good. He started the Midwest League All-Star Game in 2011, threw a complete game that year and was even the starting (and winning) pitcher in the Quad Cities River Bandits Midwest League championship game that September. His minor league numbers might not be quite as eye-popping — in 285 1/3 innings he struck out 293 and walked 98 while giving up 112 earned runs — but he made 48 starts and had a record of 22-14. Yes, the rotation is already crowded. Yes, even the competition for the rotation coming up this spring is already crowded. But if it’s what he wants to do and what he’s more than capable of doing, why not give him a shot? Oh, because then a closer will be needed? Simple answer there, and it has nothing to do with waiting on Jason Motte’s return: Joe Kelly. Closer in the big leagues would be new for Joe, yes, but it’s certainly an area where he has experience — and expertise. As a pitcher for the University of California – Riverside, he set a school record with 24 saves and was named an All American. He was drafted by the Cardinals in 2009 and “seen as a potential closer,” according to John Sickels. Yet he started more than he relieved in the minors, with 54 of his 77 appearances starts. Since he was called up to the big leagues in 2012, 31 of his 61 appearances have been starts. Yes, he’s been good as a starter — particularly in 2013. But is he guaranteed a chance to start this season, especially with the number of starters and potential starters out there? And, granted, he’s not a strikeout pitcher. But he throws hard, with his fastball in the mid 90s plus his power sinker. Yes, he usually gives up a good number of hits — he’s allowed 124 in 124.0 big league innings — but he does keep those runners from scoring once they get on base, which is what matters. Whether he wants to close again — or if he prefers starting — is unknown. Chances are he’d want to be a starter. As we can see from Trevor’s comments about being a starter, everyone wants to be a starter — which does make sense. Higher profile, more impact on the game in a way. Absolutely makes sense. Yet the closer too has a crucial role in a game. As we’ve witnessed the hard way from time to time, struggling in the closer’s role certainly makes a huge impact — which is why Trevor ended up in that role anyway. Finally, none of this is going to happen, of course. We know what Matheny and Mo said about Trevor, that’s obviously going to be the plan going into Jupiter in three weeks and Joe will likely be back in the bullpen once again. An abundance of starters, and starting candidates, is a good problem to have. And speculating about who could fill what other roles certainly helps pass the time during a seemingly endless winter. Because who knows what could happen in the future? This entry was posted in 2014 Cardinals and tagged Closer, Joe Kelly, Starting rotation, Trevor Rosenthal by Christine Coleman. Bookmark the permalink. Pingback: What I’ve been reading lately « The view from here.